We guarantee smooth and safe house and office moves in the European Union. We carry out international removals, national pick-ups and deliveries, and of course every type of relocations in the Liverpool city centre and surrounding areas. We carefully run our own company and we know how important it is to choose the right business partner. Especially, when it comes to entrusting such a responsible task as office removals, or even the whole company or factory relocation to people we do not know. That is why we can guarantee a full understanding and offer free survey, advice and estimate. We will provide a personal touch to your home or business move, absolute punctuality and professional organization of all activities so that they are no burden to your every day operations. The basis and the main goal of our house and office removal company in Liverpool are to provide our customers with a safe removal service for their property. 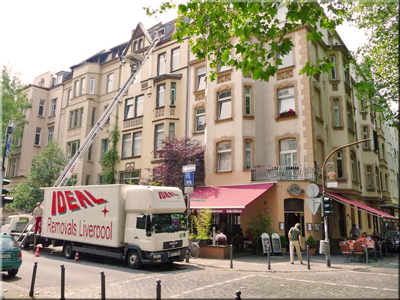 We guarantee that our house and office movers in Liverpool are adequately trained and take care of every phase of your move. With many years of experience in the field of home, office, moving machinery and warehouse relocations in Liverpool we know how to coordinate all removal services to complete the project on time and as planned. We are also able to adapt to your life style or work out of business hours and provide different forms of goods-in-transit protection so as to satisfy the most demanding customers. For our Liverpool movers, nothing is impossible. We know how to plan an office move, organize your factory relocation, and carry out machinery removals or a warehouse transition. We specialize in shipping from Liverpool to Australia, Canada, USA, New Zealand and South Africa. We move furniture, boxes, cars and motorcycles. We provide removals from Liverpool to France, Germany, Spain or Switzerland. In fact we can move you from anywhere in the UK to everywhere in Europe and Worldwide. We can also ship your baggage, boxes with private items, antiques, paintings and domestic furniture back to the UK from most overseas destinations. We will relocate your company from anywhere in the EU, regardless of the type of industry and your company size. We also specialize in international removals particularly in the shipping of delicate and unusual things, such as antiques, works of art but also delicate machinery. All our services are coordinated from our head office in Liverpool and are carried out efficiently, quickly and at a reasonable price. We know what does the phrase Cheap Removals Liverpool mean. In order to obtain additional information and to arrange a free quote please fill in the inquiry form on our website or contact our moving firm in Liverpool directly. If you decide to pack we can provide you with the packing materials well ahead of the move so you have enough time to get everything ready. Some of our clients in Liverpool pack the less fragile items and leave for us to pack all the delicate and breakable items such us porcelain, glasses, plates, ornaments, mirrors etc.. Of course we can provide a full packing service and pack your personal belonging, clothes, and kitchen utensils, disconnect your fridge, cooker, tumble dryer and even dismantle your double bed, sofa or a wardrobe. You do not have to worry about the heavy items lifting. Our local and cheap Liverpool movers, if needed, will carry the furniture down and up the stairs, load the removal vehicle, deliver your goods to your new property and place the goods in the right places according to your instructions. If you are planning to move an office in Liverpool we can provide complex removal service which consists of planning, preparation and execution. During the free office survey we will gather all the necessary information to prepare a very detailed move schedule. Removals Liverpool will provide man and van resources required to organize and perform your move. Our move managers and team leaders will do all the work for you and make sure that all the goods are unpacked and set up according to your instructions at the new address. In addition to the provision of comprehensive and complex removal services, our cheap removal company in Liverpool takes full responsibility for your property. Because our movers organize and carry out the move they know they can afford any mistakes. We encourage you to familiarize yourself with our complex removals offer. The most effective protection method used for different equipment (when moving computers, printers, photocopiers, fax machines, electronic equipment, etc.) is to pack them in their original boxes. We realize the no companies, due the lack of business storage, keep the original boxes. We have a good solution in such situations. As professional commercial relocations company in Liverpool we are equipped with advanced moving equipment. We also provide moving crate hire service for office files, stationery and private items from office desks and pedestals. Our man and van Liverpool employees will pack the computers in bubble wrap and placed it in the appropriate server cases and cages. All cables and accessories are always moved in the same box as the computer. When packing items with such a delicate structure we take special precautions. We use our special wooden and plastic boxes covered with polystyrene foam or foam filler. The delicate items are fixed in one place. The foam protects all delicate things from the damage during the move. Kitchen items and all services (lunch, coffee, a porcelain tea service etc.) are packed in bubble wrap (no wrapping paper), as it increases the cushioning and effectively prevent all items from damaging during the shipping. Other kitchen utensils like pots and pans are packed in cardboard boxes. Next in line is to pack cutlery and kitchenware. Food and spices go in separate boxes. Each box is described by content. With such packed kitchen even a person than did not do the packaging is able to cope with the unpacking. After completing the previous steps the next one is to protect the office furniture. Our packers and movers in Liverpool will pack it in blankets and cardboard, which effectively protect them from scratching.